I don’t think anyone can deny the recent contributions of Hilary Mantel’s brilliant work Wolf Hall & Bring up the Bodies — the books, the play and the TV drama to Henry’s as well as Tudors’ popularity in general! We just hope the author finishes The Mirror and The Light, the third and final installment of her Thomas Cromwell series, as soon as possible and we have our Henry back on screen in a few years! 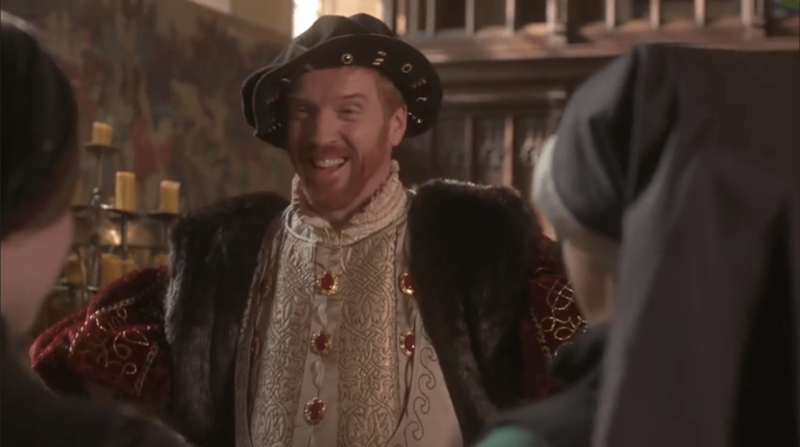 And now, in celebration of King Henry’s birthday, it is my utmost pleasure to re-visit the most memorable Henry moments in Wolf Hall TV Drama. Taking inspiration from Vicky’s fun retelling of walking in the footsteps of Milo Shakespeare, here’s me walking in some of the footsteps taken by Damian in his home town. Enjoy! Gotta love it when a passing thought from one post leads to an entire new fully-fleshed-out post. I had remarked, during my two-week tour in London, I was reminded often of places I’d seen Damian in images and film. In particular, when I was walking from Shakespeare’s Globe west towards Blackfriars Bridge along the Thames Path I looked down to the river and saw the moss covered walls where Damian and Helen leaned and loafed for a photoshoot, as well as the pier under which Hector made a phone call in Our Kind of Traitor. That bit of Proustian mind-wandering lead Damianista to the thought, “Hey, why not do a post where we follow along in Damian’s footsteps throughout London?” “Isn’t that a bit stalkery?” I worried. “Nah,” we both concluded. Happily, Damian knows we are the most harmless variety of stalkers he could ever have. So, here it is, a catalog of all the places and sites where we “saw” Damian, characters he’s played, and stories he’s been a part of in his beloved home town. Hello everyone! Damianista welcomes you to a NEW Fan Story Tuesday! Most of us joined Damian Lewis fandom after seeing him in one of his major roles such as Major Winters in Band of Brothers or Nicholas Brody in Homeland. Sure, there are others that “found” him in less likely situations, say, when he played Laertes to Ralph Fiennes’ Hamlet on Broadway 22 years ago or when he hosted Have I Got New for You! And, today, we have two fans who noticed our favorite actor through his better half, beautiful and ridiculously talented Helen McCrory! So, without further ado, here is Martina and Heather sharing with us how they became Damian fans through Helen. ENJOY!